To use Alpha 3D, you must use one of these brushes: Standard, Layer, or the Chisel 3D brush. Upon selecting one of these types of brushes you will see the Mesh Selector on top of the canvas. This lists the available content for the selected brush. Simply pick a VDM of your choice, then click and drag the cursor on your model to sculpt it using the VDM shape stored in the selected brush. Creating your own Alpha 3D brushes is the key to producing advanced models and increasing your productivity. They can be designed to generate highly detailed models or just to produce mid-resolution shapes like an ear that you can refine later. Load one of the Brush3DTemplate projects located in LightBox >> Project >> Brush3DTemplate folder. You have different grids to choose from. To be rec­ognized as a VDM, the model must be sculpted on a grid with square borders. 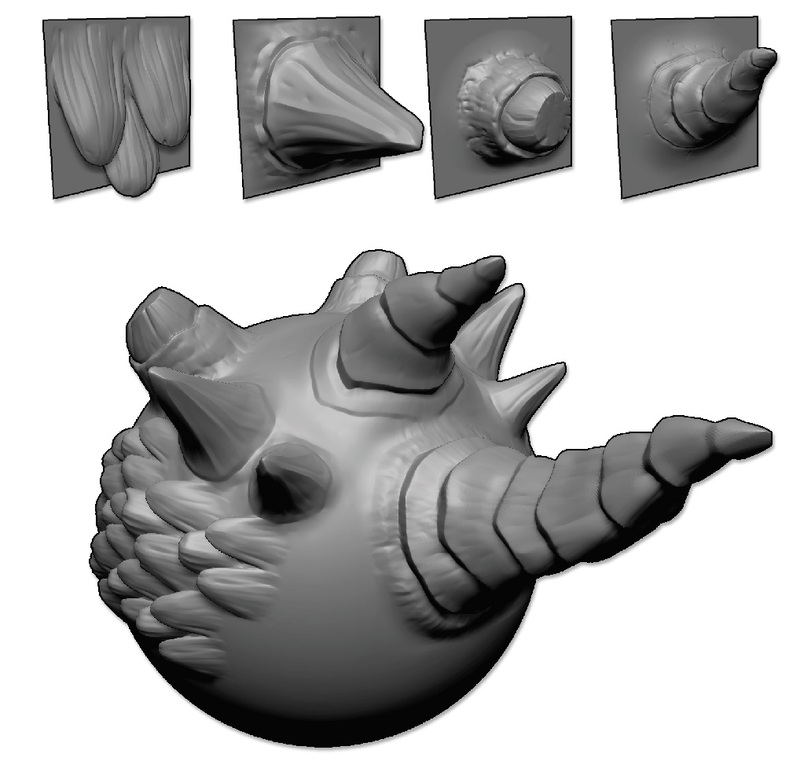 Sculpt your shape with the regular ZBrush tools. Since you must maintain a grid structure you won’t be able to use some features like the Slice curve or DynaMesh. Feel free to use Subdivision surfaces and to push/pull your geometry. If you notice some stretching you can use the Tool >> Deformation >> Relax Plane Grid function to relax the topology before you continue sculpting. It is advised to use this function when you are at the stage of building the rough silhouette of the VDM. Once your model has been sculpted you must check that the boundary of your grid is still a square. If not, you can mask everything except the boundaries, then use the Tool >> Deformation >> Morph to Grid slider at 100% to revert the boundaries to a perfect square. You can follow the above steps as often as you wish to create multiple Sub­Tools, all composed of models sculpted from the various grid base shapes. Disable Draw >> Perspective and align the front of the model to the camera by holding the Shift key while rotating. You want to have the grids directly facing the camera. Select one of the brush types compatible with Alpha 3D: Standard, Layer, or Chisel3D (which is actually a Layer Brush) and clone it through the Brush >> Clone function. Otherwise the next steps would delete the original Alpha 3D brush content. Click the Brush >> Create >> Create Multiple Alpha Brush button. All SubTools will be converted to VDMs and associated with the current brush, replacing the previously stored models. Notice that your Alpha now has a “3D” flag on it. Note: The SubTool names will be assigned as the VDM names. Try your new Alpha 3D brush on some models. If necessary, change the Brush >> Depth settings. If you feel the need to fix a VDM, you can edit some of the SubTools you had originally created to refine the grid base shapes. Once edited, redo step 8 to rebuild the brush with the updated VDMs. The Mesh/IMM Viewer above the document lists the current VDM’s included in the brush. Simply select one, then click and drag on your model to grow the shape. Important notice: If a 3D mesh is grid based, it will be treated as a VDM when the brush is created. However, if it is a regular 3D model, it will be stored as an Alpha From Mesh. Please read the sections for “Alpha From 3D Mesh and Multi Alpha” to learn more about using 3D meshes as regular alphas. Only the model on the right can be converted to a VDM because it has been sculpted on a grid. 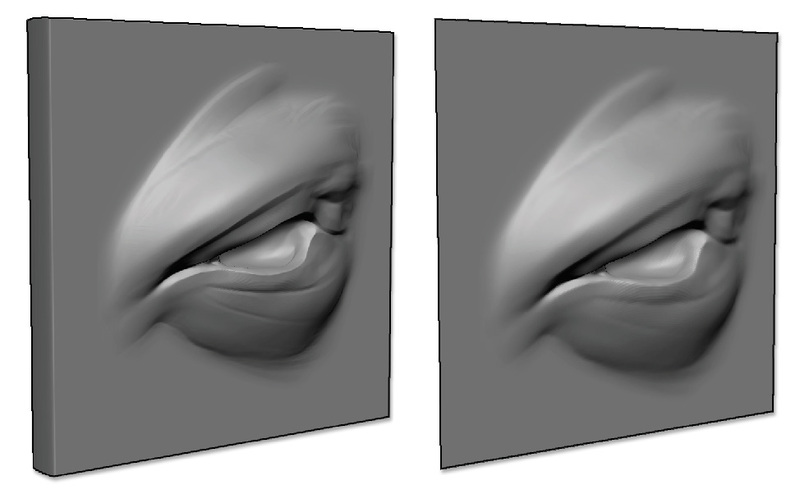 The model on the left has been sculpted on a volume and so can only be used to create an alpha.